Wood, W. 1828. Supplement to the Index Testaceologicus; or a Catalogue of Shells, British and Foreign: 59 pp. Wood, 1828, Suppl. Index Testac. : 6, pl. 2, sp. 9. Wood, 1828, Suppl. Index Testac. : 3 [as ‘Mya ambigua’]. Wood, 1828, Suppl. Index Testac. : 30, pl. 1, fig. 9. Wood & Hanley, 1856, Index Testac. : 200, pl. 1, fig. 9. Wood, 1828, Suppl. Index Testac. : 7 [as ‘Arca elongata’]. Wood, 1828, Suppl. Index Testac. : 41, pl. 2, sp. 10. Wood, 1828, Suppl. Index Testac. : 3, pl. 1, fig. 12. Wood, 1828, Suppl. Index Testac. : 40 [as ‘Hyria corrugata’]. Wood, 1815, Gen. Conch. : 106, pls. 20-21. Wood, 1825, Index Testac. : 12, pl. 2, sp. 28. Wood, 1828, Suppl. Index Testac. : 57 [as ‘Unio crassus’]. Wood, 1828, Suppl. Index Testac. : 3 [as ‘Mya obliqua’]. Wood, 1828, Suppl. Index Testac. : 57, pl. 1, sp. 8. Wood & Hanley, 1856, Index Testac. : 200, pl. 1, fig. 8. Wood, 1828, Suppl. Index Testac. : 2 [as ‘Mya oblongata’]. Wood, 1828, Suppl. Index Testac. : 57, pl. 1, sp. 2. Wood in Hanley, 1856, Index Testac., Suppl. : pl. 1, fig. 2. Wood, 1828, Suppl. Index Testac. : 3 [as ‘Mya rigida’]. Wood, 1828, Suppl. Index Testac. : 57, pl. 1, sp. 10. Wood & Hanley, 1856, Index Testac. : 200. Wood, 1828, Suppl. Index Testac. : 3 [as ‘Mya rugulosa’] [nomen nudum]. Wood, 1828, Suppl. Index Testac. : 57, pl. 1, sp. 7. Gray in Wood, 1828, Suppl. Index Testac. : pl. 2, fig. 5. Aetheria elliptica (Lamarck, 1807). — Wood (1828: 7). Anodon anatinus (Linnaeus, 1758). — Wood (1828: 30). Anodon cygneus (Linnaeus, 1758). — Wood (1828: 30). Arca rostrum Wood, 1828. — Wood (1828: 6). Castalia ambigua Lamarck, 1819. — Wood (1828: 3). Hyria avicularis Lamarck, 1819. — Wood (1828: 40). Hyria corrugata Lamarck, 1819. — Wood (1828: 40). Iridina elongata Sowerby, 1821. — Wood (1828: 41). Iridina nilotica Cailliaud, 1823. — Wood (1828: 7). Iridina ovata Swainson, 1823. — Wood (1828: 41). Mya angulata Wood, 1828. — Wood (1828: 3). Mya gravis Wood, 1828. — Wood (1828: 3). Unio alatus (Sw.). — Wood (1828: 2). Unio batavus (Maton & Rackett, 1807). — Wood (1828: 57). Unio cariosus Say, 1817. — Wood (1828: 57). Unio corrugatus (Müller, 1774). — Wood (1828: 57). Unio crassus (Wood, 1815). — Wood (1828: 57). Unio elongatus Lamarck, 1819. — Wood (1828: 57). Unio nasutus Say, 1817. — Wood (1828: 3). Unio nodulosa Lamarck, 1819. — Wood (1828: 57). Unio obliquus Wood, 1828. — Wood (1828: 3). Unio oblongatus Wood, 1828. — Wood (1828: 2). Unio pictorum (Linnaeus, 1758). — Wood (1828: 57). Unio praelongus Barnes, 1823. — Wood (1828: 3). Unio radiatus (Gmelin, 1791). — Wood (1828: 57). Unio rigidus Wood, 1828. — Wood (1828: 3). Unio rotunda Wood in Hanley, 1856. — Wood (1828: 2). 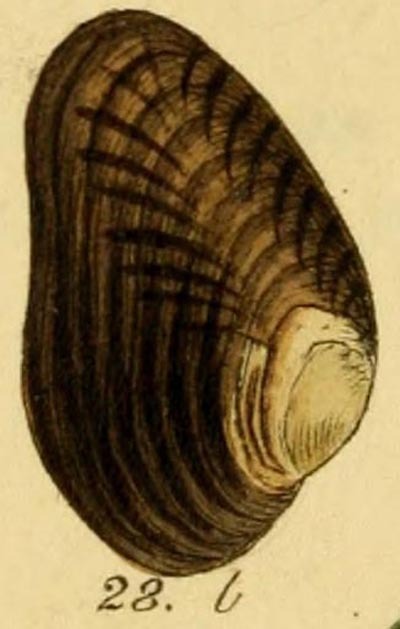 Unio rugulosus Wood, 1828. — Wood (1828: 3). Unio undulata Say, 1817. — Wood (1828: 3).